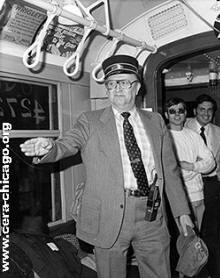 In 1980, George Krambles shows "his" car 4272 to CTA employees and CERA members, Pete Vesic and Lou Gerard. GK had an appreciation of history and its use as a marketing tool. He also encouraged railfans to work at the CTA, realizing that their interest gave them a leg up on the non-fan in many instances. Talented, a quick study, hard-working, and generous – these were just a few of the attributes of CERA founder George Krambles. They were the characteristics that made him a leader throughout his life and led to his success in professional and recreational endeavors alike. Without “GK” as he was known to family, friends and colleagues, CERA would still have existed, but certainly the quality and quantity of its bulletins, the content of its meetings and the extent of its fantrips would probably have been quite different. He was able to strike the right balance between professional and hobby activities, knowing when there was a railroad (or surface system) that needed to be run and when it was appropriate to “play train.” His appreciation of history was a distinct benefit to CTA and CERA (along with many other railfan organizations in which he was an active participant/director). For example, during the development of the “Skokie Swift” in the interest of streamlining the operation so that one-person train operation would be safe and practical, he led CTA to the use of automatically raised and lowered pan-trolleys. The history lesson comes from adding the airfoil to the pan-trolley to keep it in contact with the wire at higher speeds – GK had recalled the pioneering work done on high-speed, light pantograph operation on the Illinois Terminal some 30 years earlier. That appreciation of history was best reflected in his amassing of a huge collection of photographs, negatives, slides and other memorabilia, which has appeared in most every CERA bulletin since the first one was issued in late 1938. He began collecting early, including scrimping on expenses while a student at the University of Illinois (UofI) at Urbana-Champaign in the early-1930s – that allowed him to buy builder’s photos from Cummings Car & Coach in nearby Paris, IL. Later, while at CTA, his interest in preserving photos was well-known, and when the young transit agency was in the process of thinning out predecessor company records George and life-long friend (a fellow fan, one of CERA’s pioneering members) Bill Janssen got the call to be at West Shops at a specific day and time to be able to save hundreds of CSL negatives. George and Wilbourne Cox (another professional colleague and fan) preserved the work of Albert F. Scholz’s “Logan Square Studios” (company photographer for many of the Insull properties) when they bought the studio in 1940. Wilbourne continued to use much of the photographic equipment (he was company photographer for bus-builder Aerocoach, among others), while George preserved many of the negatives and photos Scholz’s firm had taken. GK applied himself to his studies and work with characteristic drive. He excelled in his pursuit of a Railway Electrical Engineering degree from UofI, as he did in his professional career, first as a management trainee at Indiana Railroad, and later at CRT/CTA and even after that as an industry consultant. While the fan side of GK certainly enjoyed the time at Indiana, his professional side could see that the Indiana was not viable enough to survive building labor and financial pressures in the mid-30s and he left the road, joining the CRT in 1937. His 43 years with CRT and CTA were marked by progressive advancement through the engineering, planning and operations ranks, culminating in his being named General Manager (later, Executive Director) of the CTA a position he served in between 1976 and 1980. He was a demanding boss, but he expected no more of his staff than he did of himself. And he became a loyal mentor to any associate who rose to the challenges he presented. His life was the CTA in this era and he was intensely proud of the agency and of its employees. From the earliest days of his career, George had seen that the interurban and urban transit carriers were no longer attracting and retaining the top talent. At the time of his retirement, this concern led to his founding the George Krambles Transit Scholarship Fund. Over the next 25 years, the fund provided assistance to over 100 students in the transportation field, many of whom are the leaders of today’s industry. After leaving the CTA, GK “flunked retirement” but in his characteristic way, he did so far more aggressively than many younger men. He became a sought-after transit executive consultant, while at the same time remaining involved in operations and planning. When light rail began its North American renaissance, GK was there, consulting extensively with San Diego Trolley and other properties throughout their formative years. It was appropriate, given that he and the CTA project team endowed the “Skokie Swift” with so many light rail-like attributes. George embraced technology, as evidenced by use of early advanced typewriter equipment on CERA bulletins (the IBM “Electromatic,” for example), transitioning into early word processors and through several generations of Apple “Macs.” His desire to expand his knowledge base led George to encourage participation in international trade associations, including the UITP and he traveled to many of the association’s international congresses, both while with CTA and after retirement. He was generous with his knowledge and with his collection. Images from his collection appeared in magazines and books published throughout the world, and not just in rail transportation publications. Nearly a decade after George’s passing, the mention of the “Krambles collection” or of the man’s own photographic work continues to elicit tremendous respect.